Grew Up… a long, long time ago. Kaname is one of the founders of the Kuran family, an ancient line of Pureblood vampires. Living… at Cross Academy, a private school run by Kaien Cross. Kaname and Kaien co-founded the school as an experiment to see if humans and vampires can live side by side. But most of the human students still don’t know that their classmates are vampires. Profession… student. Technically, anyway. He attends classes with his vampire peers. But Kaname is vampire aristocracy, and his real job is keeping the vampire students in line, preventing them from feeding off the humans. Interests… few. Apparently Kaname’s magical powers are so great that if he allows his mind to wander, he might accidentally hurt someone. So, usually he’s all business. Relationship Status… single. 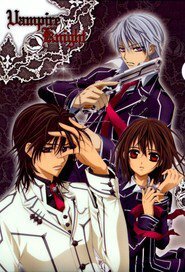 Kaname is immensely protective of a human student named Yuki Cross, the adopted daughter of Kaien, the headmaster. While Kaname is usually stern, he’s strangely forgiving when it comes to Yuki. For Yuki’s part, she remembers Kaname saving her from vampires when she was little, and so looks up to him. Challenge… controlling vampires and protecting Yuki. While Kaname has a great deal of power, there are forces that conspire to ruin the truce that he and Kaien have built. Personality… reserved, noble, and dangerous. Kaname’s demeanor is usually very calm and aristocratic. But he knows who’s in charge and he’s not afraid to enforce the rules, or enact strict discipline. Around Yuki, though, he softens and become warm and indulgent, which makes the other vampire students uncomfortable. Kaname Kuran's popularity ranking on CharacTour is #422 out of 5,000+ characters. See our top-ranked characters and read their profiles. Vampire Knight is a shōjo manga series written by Matsuri Hino. The series premiered in the January 2005 issue of LaLa magazine and has officially ended. Chapters are collected and published in collected volumes by Hakusensha, with seventeen volumes currently released in Japan. The manga series is licensed in English by Viz Media, who has released fifteen volumes so far. The English adaptation premiered in the July 2006 issue of Viz's Shojo Beat magazine, with the collected volumes being published on a quarterly basis. Two drama CDs were created for the series, as well as a twenty-six episode anime adaptation. Produced by Studio Deen, the anime series' first season aired in Japan on TV Tokyo between April 8, 2008 and July 1, 2008. The second season, aired on the same station from October 7, 2008 and December 30, 2008. The anime uses many of the same voice actors as were used for the drama CDs. The anime adaptations were licensed for release in North America by Viz Media, the DVD released on July 20, 2010.